This section contains various bits and pieces on road development in Ireland which didn't fit into other areas of the site. First is a list of completed and upcoming major road projects in Ireland. Minor schemes are not included as there are too many of them. The list only shows schemes of dual carriageway or larger. The exact date is not always known. 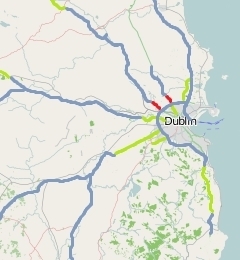 Many roads in Ireland open as dual carriageways and are subsequently redesignated motorways. From a legal perspective, this is a much easier way of getting the motorway built. Click here for more information on this and for a factsheet on the terminology used in road construction in Ireland, which can vary by country. Next is an area where you can browse graphs showing traffic counts on the trunk network, followed by information on year-by-year completions. With such a rich archaeological heritage and large areas of unspoilt scenery, it was inevitable that many road building projects in Ireland would prove to be controversial. An essay on this. 1 Redesignated motorway on 2008-09-24. 2 Redesignated motorway on 2009-08-28. Redesigated schemes either opened as dual carriageway or were specified as dual during the planning and/or construction phase. Distances in parenthesis are widenings or improvements of existing routes and so do not count as new mileage of roads. Some notes on terminology and motorway designation in Ireland. Traffic Count graphs for all motorways where data is available. Count data is pulled from the NRA's site. Timeline maps showing road building development since the 1970s. There is a medium-sized map, a very large version, and a version just showing the Dublin region. These are calculated by summing all projects completed that year. Some projects were completed in a particular year, but were only designated motorway some time later. They are listed under the year they became motorways. Completions in the future are estimates based on roads in the pipeline, as well as dual carriageways likely to be redesignated motorways in the future. The 2020 figure may be higher.